(1:30 p.m. EDT) -- Get ready to scream: Multi-platinum, Grammy-nominated musician Nick Jonas will be performing on two Carnival cruise ships this fall. The concerts, part of the line's Carnival Live series, will take place November 17 and November 18 on Carnival Liberty and Carnival Victory, respectively, while the ships are docked in Nassau. The concerts are only open to people on the cruises. Carnival Live tickets for the shows are $75 for general admission. While that's at the high end for Carnival Live shows, the line pointed out it's a lot less than land-based concerts. (And the theaters used for the Carnival Live shows are small, between 900 to 1,300 people, with great sight lines). VIP tickets cost $250 and include seating in the first few rows, a photo op with the artist and a commemorative concert pass. 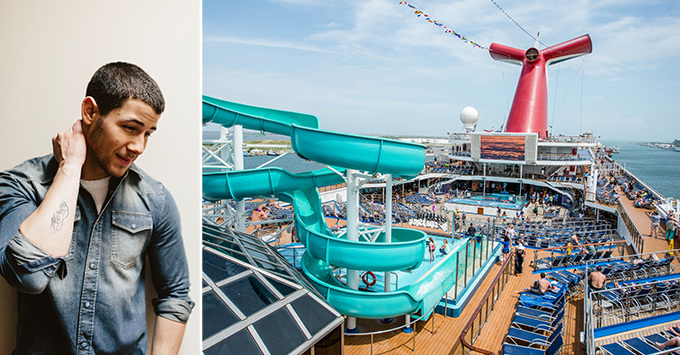 "This will be my first time performing on a cruise ship, which I'm really excited about because it's so different than any other venue," Jonas said in a statement released by Carnival. "I'm looking forward to seeing and performing for my fans that will be there." Additional Carnival Live acts will to be announced in the coming months, the line said.